After nine volumes of manga about an eccentric university club of manga, video game, and anime fans, two anime series adapting a fair part of the story and including some OVAs of its "story within the story," a disreputable spinoff anime making changes to the show-within-the-show that did include some OVAs adapting a bit more of the main manga, and a short manga version of the disreputable spinoff, Genshiken came to a close. With picky manga-buying habits when that happened (mostly because of the constant scandals ginned up over various companies retouching the art to water it down for North American sensibilities, something Del Rey Manga, the company releasing Genshiken, had made a point of saying it wouldn't do), I did wonder about how to fill the space taken up by a standout title. Then, though, to what seemed the surprise of others too, Kio Shimoku started the Genshiken manga again, with new characters added to continue the story. With another three months gone by, once again I'm taking a look back at the anime I watched in them. I seemed to keep up a pretty brisk pace of viewing, but even a brisk pace just chips away a little faster at the DVDs and now Blu-Rays I've accumulated over time. When thinking of that, though, I can at least contemplate with a little more equanimity the end of an era where I made regular orders from the online store Right Stuf because everyone else on the anime message board I follow the closest seemed to order from it too and manage to get free shipping just by putting together pre-orders, regardless of whether I had a strong interest or just sort of an idle curiosity in each title. In waiting for a sufficient number of series to buy at once, though, I might be worrying about my buying intentions corroding in the face of regular crises on the board over "domestic" releases fallen from the audiovisual excellence of the Japanese originals. I've known for a while now that some of the most vocal figures there just buy the Japanese originals, but for just as long now I'm stuck with the reluctance to spend that much money for those releases that do have English subtitles, not to mention the reluctance to go to lengths to become fluent in Japanese and then spend that much more money on untranslated releases, to proclaim some measure of moral superiority. Even with all of that, though, I did manage to put one order together recently, in advance of the end-of-year sales no less. The manga "Genshiken" became one of my favourites to such an extent that as it came to an end with the graduation of the fan characters who had been entering university at its beginning, I wondered "so now what?" I continued to poke along buying this manga or that (although even with all the titles I wasn't buying, of late I have managed to realise I have a stack of volumes I haven't managed to read yet), and the creator of Genshiken Kio Shimoku started a new title I heard only vague comments about... and then I happened to hear he was returning to Genshiken, building off the handful of younger fans who hadn't graduated at the end of the manga. I suppose there were uncertain thoughts from some about the whole "returning to something thought complete", but as it turned out some people began "scanlating" the new chapters, and once I had happened on them I began to enjoy them, new characters and new emphases alike. One of the thing that might have helped me there, though, was that one person who drifted into the "scanlation" picture could write better translated dialogue than the awfully stiff stuff I seem to find too often in fan translations. With that said, of course, reading the online translations without paying for imported copies of the Japanese-language volumes did, or should have anyway, scratch at me a bit. Then, all of a sudden, the news arrived that Kodansha Comics, in addition to printing omnibus volumes of the previous Del Rey Manga releases, also had a preliminary solicitation for the new series. However, there have been any number of mutterings about corners being cut and small infelicities in the proofreading of the Kodansha Comics releases, which, as much as I seem to dislike intimations of "fan translations" being better than "professional translations" just because, leaves me wondering about how things might compare (or even if, after a while, they'll be able to...) Still, even if some can't square their refined consciences with buying "domestic releases" but not "consuming" them, I'm at least willing to see what happens. This look back at all the anime I've watched in the past three months may be one I've been thinking about in advance and even looking forward to a bit more than usual, and that's because I can also look back a lot further than three months. 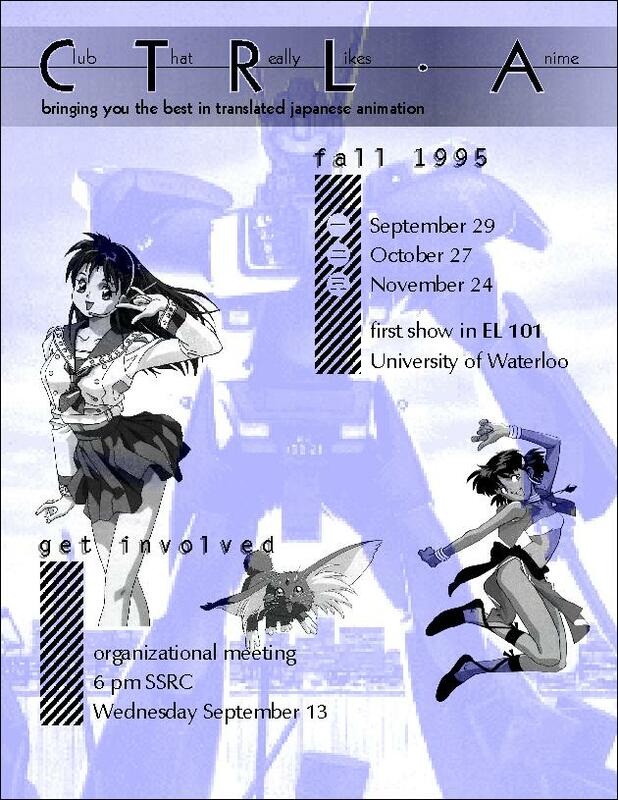 The first time I managed to write one of these posts (looking back at a whole year), I mentioned it had also been over ten years since I'd arrived at university and joined the anime club there to start watching it, completing a process of figuring out little by little that a memorable Saturday morning cartoon of the 1980s wasn't an isolated artifact. Now, it's been an even fifteen years since I spotted that first poster, still linked to by a club that's still around. (I still don't know who the character on the left side of the poster is, though.) One more recent orientation poster I've also managed to see seemed to promise a more social aspect than most of the time I was there, when people packed into one of the largest lecture halls on campus but just sat and watched in the dark; of course, back then it was harder to "just see" the stuff. That thought can provoke a melancholy feeling or two in turn, though: while I can now watch a lot more anime in one month than just one evening's worth and make up my own schedule, perhaps indeed broader in the kinds of shows I watch and enjoy than back then, I no longer have the sense that "fansubs" are something rare and mystic to be attained only through ingratiating yourself with those who know a lot more than you do, but something the almost effortless availability of which has created a new, barbarian generation many of who find excuses to not support any of the people who depend on it for a living and perhaps, in not valuing the stuff they watch, add to a sense that a lot of people don't really enjoy it anyway. Despite that last comment, though, I've done my best over the years to avoid winding up like any number of online curmudgeons; however, sometimes my longevity as a fan now leaves me just sort of wondering. I'd like to think I just try to keep a broad, clear, positive perspective that doesn't make extreme demands, although I can imagine this could be turned back into a "no standards" accusation. I've wondered if starting to watch anime (known as such) in university (and not being that obsessed with "animated shock value") instead of high school (where I was running just on memories of "having seen" an interesting cartoon or two) has made a difference too, but I suppose that any hint of "maybe some people just grow out of anime (even if they haven't realised that yet themselves), and that's all right" has its own heavy bundle of ambiguities. In some ways, I've started to wonder if (many) anime series appeal to me not just through "overarching plot," but through striking a good balance between that and "not having to carry on season after season until the fans' desires have all diverged from the creators' intent and the ratings slide." At other times, I just have the simple and somehow satisfying thought "I like the way it looks," as quick as I would be to add that not all anime "looks alike." 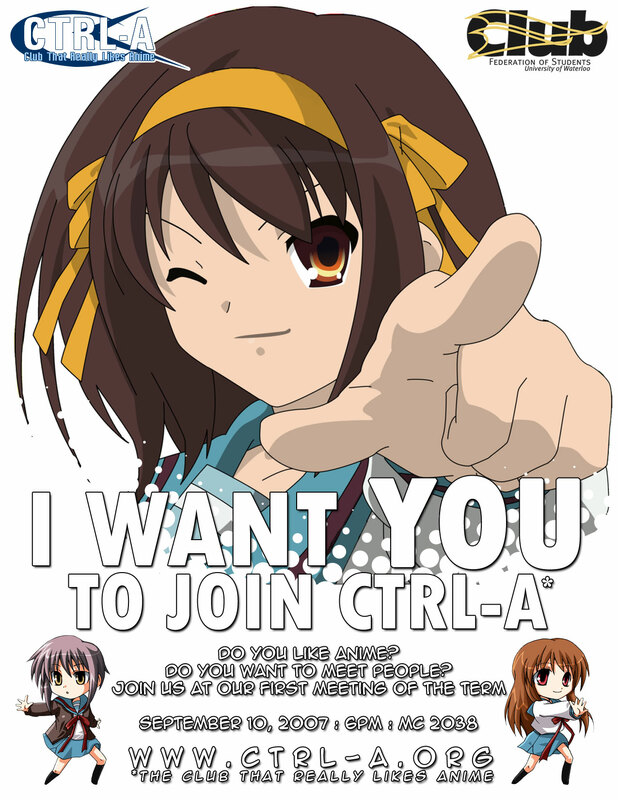 Beyond mere personal feelings, I'd also say that a factor in my longevity may have been the community of the long-lived "Anime on DVD" forum. It's not perfect, of course: a lot of people nitpick to extreme amounts releases of shows they actually discussed back as "fansubs" and a regular feature of the board seems to be people whose standards have risen to such an extent that they can no longer buy cheese-paring "R1" North American releases but instead make a big deal of spending lots of money to import "R2" Japanese discs, and at least as far as I'm concerned an unpleasant occasional note is people making nasty side references to Star Wars. Nevertheless, this seems more than outweighed by the simple fact that people generally seem to enjoy the stuff they watch, and even to offer counterarguments every so often to those who haven't liked any anime title made in the past twenty years. I have the impression that you don't have to be a fan of anime or manga for very long before you start hearing the Japanese word "otaku." (For that case, some who aren't fans may have heard the word already.) In my case, though, it didn't seem that much longer after that before I started hearing people insisting that those North American fans using "otaku" as a mere synonym for "fan" were in fact labelling themselves with a term meaning more "grotesque fanboy who uses fictional characters as a substitute for an inability to form connections with actual people..."
However, there have been pushbacks to that grim definition at different times and in different places. One of them is with a manga series that had an anime adaptation made of it, "Genshiken." After finishing the ninth and final volume of the manga with a sense of satisfaction, I was nevertheless left with a sort of annoyed "So now what feeling? ", aware of my uneasier and more tentative connection to manga than to anime. (I managed to put this feeling into words well enough for it to be selected for an anime question-and-answer column's recent "I ask the question, you give your answer" section.) Nevertheless, I wasn't done with Genshiken quite yet: I had also picked up the anime version on sale a while before, and had it sitting around since. I suppose I did start tearing the shrinkwrap off with a sort of uncertain "But what if I don't like this version?" thought, and yet I did start watching.